This evening I donned by Mah Jongg bracelet and made my way over to USC, where both Jacki and I had the pleasure to attend the installation of Ludica's own Tracy Fullerton as the Electronic Arts Endowed Chair of Interactive Media at the School of Cinematic Arts. The declaration at the beginning of the ceremony met with rousing applause before Dean Daley even finished her sentence. Keynote John Riccitiello, Chief Executive Officer, Electronic Arts gave the keynote, pointing out that this is the first generation in which both parents and their children are playing video games. Characteristically humble and eloquent, Tracy gave a lovely and brief thank you, acknowledging friends, colleagues and students for their support. We are extremely proud of Tracy and this well-deserved and long overdue accomplishment, and it was an privilege to share with her this special honor. I had a nice chat with reporter Chris Nuttall from the Financial Times last week and this is the result. Enjoy! Jacki Morie and Celia Pearce of Ludica were interviewed on KPFK’s Digital Village. The live broadcast took place on Los Angeles at 10:30am Pacific on Saturday, December 29, and can be heard via streaming/podcast here. 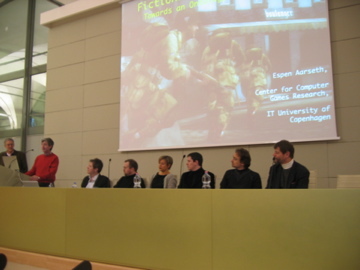 I’m reporting from Reggio Emilia, Italy, where I presented Ludica’s paper, "Playing Dress-Up: Costumes, rolepay and imagination," at “The Philosopy of Computer Games", an interdisciplinary conference dealing with a variety of philosophical issues (I would say fairly broadly construed) pertaining to games. The color poster for the conference, which features a Second Live avatar fyling into the orizon, as well as the program, and origins of the conference can be found on the conference web site. Briefly, it was organized by a consortium of Norwegian and Italian scholars, who were interested in the subject of philosophy and games. Here is a picture of the opening panel introducing the organizers. The people seated are the Norwegian crew, along with our old friend Espen Aarseth, who is Norwegian but based in Denmark at the moment. Standing are the people from the hosting Institution. The organizer, Patrick Coppock, an Irish chap who lived for many years in Norway, is at the side of the podium. The facilities, located at the University of Reggio Emilia and Modena, were beautiful: an old building that was recently outfitted with modern accessories. One thing I noticed immediately was that there were very few women on the program—four in all for a three-day conference. This reinforced for me the importance of our mission; most of the talks concerned first-person shooter and RTS games, so it seemed almost mandatory to infuse some gender balance into the mix. The few women who where there were by-and-large already familiar with Ludica and our work, which was very encouraging. This it not meant to be a comprehensive report on the conference, but there are a few ideas and threads that I thought would be worth summarizing. A number of presentations, kicked off with Espen Aarseth’s keynote, concerned themselves with existential issues along the lines of “are game objects real.” Espen’s premise was that there are three types of game objects, which can coexist in the same game: real, fictional and simulated. He distinguished between a fictional door which serves as a prop and does not operate like a door, versus a simulated or virtual door, which has behaviors commonly associated with a door. Another example was monopoly money versus World of Warcraft platinum. In the discussion period I mentioned that I thought that example pointed out that there is an aspect of the sociological concept of “symbolic interactionism” in that the World of Warcraft money has no value to someone who does not understand its relative value in the game, regardless of it’s real world currency exchange rate. A number of talks also dealt with the status of game objects: Are they “things?” are they pictorial representations? Are they “real” or “fictional”? etc. These questions were interesting form the perspective of “the nature of being,” or “existence,” but the variety of solutions and arguments to this problem were somewhat dizzying and to some extent, I felt, inconclusive. Perhaps because of my disciplinary bent, I tend to view these matters from the perspective of the player: so I would argue that game objects don’t really possess any kind of “essential” material qualities outside of their meaning to players. It seems hard to do much more than make a compelling, but unverifiable argument about the material properties of game objects in the absence of the context of use and social signification. I also found it odd that no one in any of these sessions considered the possibility that game objects can also be viewed as metaphors. Another talk that was quite compelling in its premise was Richard Clarkson (University of Durham), who submitted that games could be used to dynamically solve philosophical problems by testing our intuitions. I thought this was a very exciting idea, however, I felt the games selected as examples feel somewhat short. In later discussion with Richard and others at the conference, it was proposed that perhaps existing games were not up to this task, but that new games could designed with this aim. An Italian game designer present at the conference volunteered to collaborate on this. I did note to Richard, however, about environments where social ideas played out in interesting ways, such as “twinking,” which is a topic covered in our paper: Why do people spontaneously give gifts to newer players, often players they do not know? There is an interesting underlying philosophical question here somewhere. Day two, which was themed around the player experience, opened with a presentation by Jonathan Frome, a media scholar from the University of Central Florida, who spoke on “The Paradox of Fiction,” which had to do with the fact that we believe in fiction, and it elicits real emotions, even though we “know” it’s not “real.” I spoke with him afterward and posited the theory that perhaps rather than suspending our disbelief, in games we make a decision to acts as if we believe something. I still have to mull this over, but I think it’s an interesting way to think about it. The other thing he mentioned that I thought was interesting was that there is a pleasure in experiencing unpleasant feelings in a “safe” environment, e.g., horror or sadness in a movie or game. He also talked about emotions unique to video games, like a sense of remorse, which also came up in other presentations. Many of the talks in the afternoon looked at games from a phenomenological perspective, starting from the point of sensory and cognitive experience. Olli Leino, a PhD candidate from Cophenhagen IT University gave a talk about emotions in games and gave some lovely examples. One was about becoming angry when Bismarck took over one of his provinces in Civilization IV. He talked about how one can have real emotions, which may in part be a factor of agency, e.g., that we have some perceived influence on events changes our emotional perception of them. 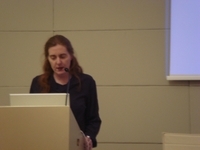 Hanna Sommerseth from the University of Edinburgh developed the idea that games are, as Jesper Juul says, “half real,” as they combine “real rules” and “fictional worlds.” Later, she and I discussed the idea that maybe players are also “half real” when they are engaged in the game. This relates back to the idea of presence vs. absence in games and virtual worlds that was discussed at Jacki’s Presence workshop at ICT back in October. I know when I present in my avatar, people have commented that my energy or persona seems to shift from my physical person into the computer. Overall, Day 2 was incredibly intellectually challenging: many of the presentations were either Powerpoint slides with text only, or entirely spoken (often recited), which required a high level of concentration, and shifting of gears and thought processes, and even argument styles. Knowing I was going to present at the end of the day, I had deliberately used bright colors (lavender text on a violent background) and many pictures to illustrate our analysis of costume play. One thing I noticed throughout the conference was that a number of the contributors, especially those from a more traditional philosophy background, did not use very many specific examples. Ours was packed with them, which I think helped to build our argument, which was particularly oriented towards sociological and anthropological approaches. It was very encouraging that when I looked out into the audience, a number of people had big grins on their faces. The discussion was lively, and there was a great deal of positive feedback afterwards, especially from the few women present. Day three was devoted primarily to issues of ethics. Adam Briggle gave a really well-formulated opening presentation, which looked at video games as ethical phenomena from a variety of angles, and in particular talked about their role in building character. One issue that this brought up was the question of the correlation between real-world and simulated behavior, and whether or not people played games as an outlet for social constraints, rather than as a model for real-world behavior. Another interesting point he made related to what sorts of mastery is valued in society, and a) are valued forms of mastery developed in video games, and b) does society value the mastery of video games in and of themselves? Conference organizer Patrick Coppack’s talk, while I won’t go into all its details, had a very interesting starting premise, based on Alfred North Whitehead and others, that all aspects of life are processes of being and becoming. “Objects” which appear static, such as a building or tree, are merely undergoing this process over a longer timeframe. I found this one of the most compelling theories presented because video games are, at their core, processes, and if we think of them as code that is actuated by the player, this notion actually makes a lot more sense than whether or not game objects are “real.” In fact, it could be argued that all game objects are processes, and not objects at all. Edward Spence gave a talk on morals and ethics in virtual worlds, focusing on the inherent “rights” of avatars. While the argument was compelling, I found it belied a lack of familiarity with the actual practice of lived experience in virtual worlds. One approach to argumentation stood out: It did not seem to make that much difference whether the theory was applicable, as long as the argument was sound. But I felt that the initial premise, that an avatar can be equated in a one-to-one way with a person’s corporeal body, was flawed. Although I agree avatars ought to be granted some essential human rights, I don’t think we really understand enough about the relationship between persons and their avatars to make any sort of definitive statements about what those rights ought to be. I also pointed out most MMOGs are totalitarian corporate entities in which players give up most of their “rights” when signing the EULA (End User License Agreement). Rune Ottoson gave a lively and highly relevant presentation about video games and military propaganda, in particular, describing the way the visual vocabulary of videogames has been adopted by the news media, and the problematic that most major news services in the U.S. are now owned by entertainment companies. His presentation was lushly illustrated with examples and quotes, and also raised the issue of the way military technologies are becoming more and more like video games. 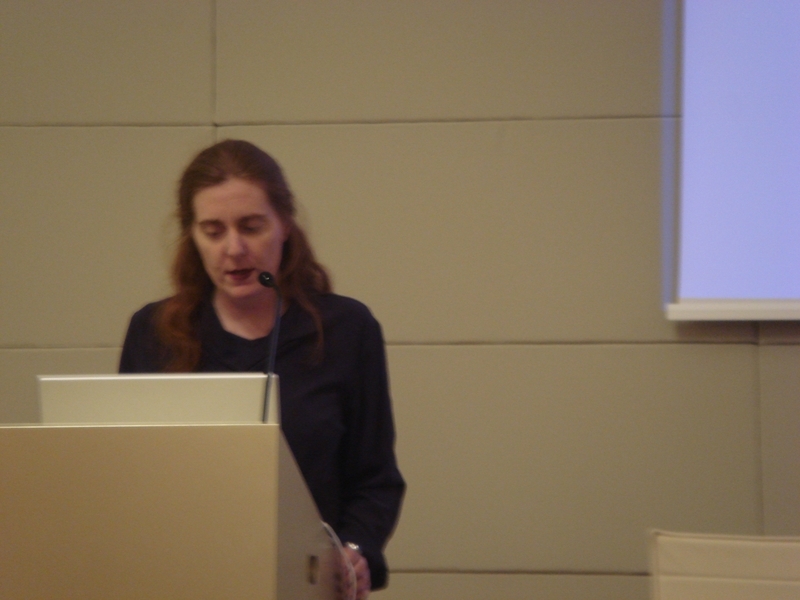 The event closed with Liz Losh, who gave an excellent case study about the Tactical Iraqui language simulator created by USC’s ISI, and also talked a bit about the work at ICT, where Ludica member Jacki Morie is holds a position. One thing I appreciated about Liz’s paper was that it was very balanced and did not take an extreme position one way or another, but really explored the nuances of the project from a variety of angles, including the perspective of the makers themselves. She also talked about the debate among game scholars, including Gonzalo Frasco, who, in his usual pedantic tone, disavowed anyone involved in creating games for the military. More tempered positions were submitted by Grand Text Auto’s Andrew Stern and my colleague from Georgia Tech, Ian Bogost. Liz made two very interesting points at the end of her talk. One was that, while Tactical Iraqi was only used by a small number of soldiers in actual training, it served a much more important role as a PR engine for both the army and ISI. The other was that everyone she had spoken to at both ISI and ICT was opposed to the war in Iraq.